41-23742 was a 8 AF, 93 Bomb Group plane. She was severely damaged during Operation Tidalwave, but managed to return to her base. She was apparently left in North Africa when the 93rd returned to England. 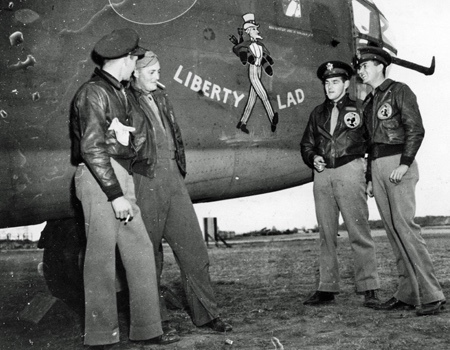 Her nose art name was LIberty Lad. Beginning in April, 1944, the sortie report for the 512th group number 31 states that this plane was 41-23742. This serial number is continually reported through May 31, 1944. On this day, the Marden Turner crew was involved in a crash landing of the plane. Ray Steven was the co-pilot that day. Click here to read his account of the incident. It should be noted that the accident report for this incident states that the Turner crew was flying 41-28926 this day. We have no additional document/s to validate which plane the Turner crew was in fact flying.